it works really easy and you can just press on your own uploaded photo’s to copy the link of it and then you can insert/edit the photo on the tab above where all the rest of the options are, I hope this helps! I also look forward to see the rest of your build! Try postimage.org. Everything looks fantastic, can’t wait for the Finnish! Thanks Toshi! I am giving it a try. Here we go with putting the fuselage together and dressing up the wheel bay with the Eduard upgrade. 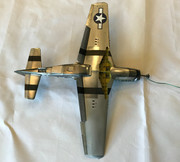 I did a B-17G 1/48 in allclad II chrome once. With the resin flaps on and the base coat of Alclad black microfill primer. The key with Alclad I find is let the base coat cure at least 24 hours and you don’t get damage from handling. Also, I always wear disposable gloves that I change regularly to prevent contamination. After the first coat of primer, then some wet sanding of the primer, a gloss black coat, then the beginning of Alclad. Base overall is polished aluminum. Then some assorted finishes for panels, with the wings in high speed silver. The Tamiya kit has more rivet details on the canopy and other areas than this kit. I am attempting to overcome that using Archer Details resin detail decals. I think they turned out great and wish I had learned of these earlier. Looking really nice...the Tamiya 1/32 kit is one I'd love to have a go at...but not until I have a work area other than the dining table, wherein I can safely airbrush Alclad metal colors and vent the fumes away....a kit of that caliber would require the best paints available for BMF's. Thanks Martin! I just subscribed to your channel. I look forward to checking out your videos! Funny you should mention the dining room table...that is exactly where I do my building...then out to the garage to spray. I definitely use a cartridge type respirator when working with Alclad. I don’t want to take chances with my health when I am trying to enjoy my hobby . If your house is like mine I actually don’t look forward to holidays when I have to clean the table of my stuff so we can entertain! Lol! Looking awesome. I’ve never tried Alclad, I should give it a try. I built the Tamiya 1/32 Mustang twice. My first Tamiya 1/32 Mustang was donated to my local VFW in Streetsboro, Ohio. The second one I built was the limited edition all Chrome Mustang. Every part that was not chromed was painted/AB with Model Master silver. Even the interior, cockpit, and engine was done in Model Master Silver. It is one of my most prized build. At first when I posted my WIP, Forum members wished me luck as it seem like a challenge. Several members noted that it looked like something you see on the desk of a aircraft companies CEO/Executive. Lol! Keep up the great work, I’m hungry for more of your WIP. I bet the chrome Mustang does look awesome! If you have a link I would love to see it. Ironically my first experience doing Alclad is with the Tamiya Mustang about a year ago. That is where I learned a lot about patience with the dry times, especially in winter. I remember doing research on other sites about using it and how fast it was to dry and mask off panels, etc. My experience was a lot more frustrating. I did get through the build and it turned out ok, but only because I got lucky in being able to cover up a lot of handling marks and self-inflicted damage under decals and weathering, and invasion stripes. I vowed I would take this one much slower and give it a fair shot. So far I am much happier giving it time to dry. My job takes me out of town for weeks at a time lately so the cure time is excellent while I’m gone. It also makes for frustrating progress but I can say I am happier so far. I may try the Tamiya kit agin someday as it does have incredible details. The challenge building a all chrome plated Mustang is that, how do you glue things together. I had to use a #7 blade and carefully scrape off the chrome in every area that was supposed to be fused. As for 1/32 Tamiya kits, you can see below a Tamiya 1/32 Zero. I also built the Spitfire, Corsair, and Mosquito. Quote: "If your house is like mine I actually don’t look forward to holidays when I have to clean the table of my stuff so we can entertain! Lol!" [/quote] That is too funny...that is exactly how I am..everytime we have guests or family come for dinner, too...I have to clear all my stuff away into storage, clean and polish the dining table, reset it, then when everyone has left...take everything back out of storage and set my space up again! Do you have a YouTube channel, and if so, do you upload any modeling videos? Drop me a link if you do and I'll reciprocate the honor and subscribe to you. That looks really cool! Like a ghost ship or something. I’ll bet it was scary putting it together without an option to repair the chrome plating if damaged. Thanks for sharing! That is too funny...that is exactly how I am..everytime we have guests or family come for dinner, too...I have to clear all my stuff away into storage, clean and polish the dining table, reset it, then when everyone has left...take everything back out of storage and set my space up again! LOL! I am glad I am not alone in this world of kitchen table comendearing! Is it bad to wish I had a bigger kitchen table? I digress. You are way ahead of me with YouTube at this stage. Maybe someday. In the meantime I will continue to learn from you I suppose.